What They Say.....Mia Gladwell s life is going nowhere. The media has skewered her debut novel, her fiance Carson, a successful Hollywood producer, has jumped ship, and now she s living in her sister s carriage house unattached, unemployed, and uninspired. 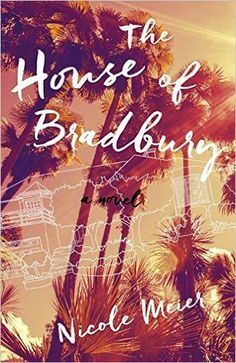 Then she learns that the Los Angeles estate of iconic author Ray Bradbury is up for sale, and she feels an immediate urge to buy the wonky old house, convinced that moving into the late author s home will inspire her to create her best work yet. Life in the Bradbury house is not what Mia imagined, however. Soon after moving in, to fulfill a debt she owes to Carson, she agrees to take in a pill-popping young actress as a tenant, and suddenly she finds herself in a balancing act between her needy ex, an unpredictable starlet, and her disapproving sister, who s keeping a close eye on her. Add to this a series of mysterious sketches left at her doorstep by a stranger, and Mia s life is more complicated than ever. As she searches for clues, though, Mia discovers insights into her own life. Maybe moving into Bradbury s house was a big mistake but maybe not. What I Say.... This was an interesting book to me. I kept waiting for the big twist - but that maybe because I just came off of a Mary Kubica book, but it never came. Mia is an unemployed writer, whose ex-husband helps her buy Ray Bradbury's old house. Since I"m not a Ray Bradbury fan, the frequent references to him and his stories were lost on me. Her ex asks her to take in a young actress who is fresh out of rehab and she doesn't think she can say no. As Mia becomes a surrogate mother to the young actress, she finds herself inspired to write again, what she writes we never really find out. In the meantime, someone is leaving little drawings in her door, which doesn't seem to be frightening or even that interesting to Mia (I would be scared witless). In the meantime, her sister is having marital problems but still finds the time and interest to be a mini Martha Stewart - lots of detail on how fancy her dinner parties are, which didn't make a lot of sense for a stay at home mom and and a history professor living in California, where did the money come from? I always wonder where the money comes from. I read another review of this book that called it "chick lit". I am an unapologetic lover of chick lit, and I wouldn't put this book in that category - I always feel like chick lit has a more "fun" element. This story just felt very level to me, but the dialogue was really good and it felt real - it just felt a lot like reading a daily description of someone's real life. I prefer a little escape.